Whether you’re looking for a wedding venue, portrait location, or event locale, Hawaii has the perfect place. It almost goes without saying that Hawaii has amazing photography venues. From beaches to golf courses, private homes to famous resorts, and seaside to mountain top, Hawaii provides outstanding locations for weddings, events, and portraits. Here is a list of our favorite Hawaii locations to help you preview a few of these spots more clearly. If you have questions about any of these locations, how they work, or what they allow, give us call. We’d love to give you any information we have to help you create the beautiful day that you want. Anaehoomalu Bay, often called A Bay for simplicity sake, is a beautiful wedding and portrait venue in Waikoloa on the Big Island of Hawaii. Close to the Hilton Waikoloa and the fronting the Waikoloa Beach Marriott, this beach, bay, and tidal pool area offers a great backdrop. Be it a nearby wedding or specifically scheduled portraits, we know the area here well and use that to your advantage, matching the right spot with the right picture. There are so many great beaches on the islands of Hawaii, but some couples opt to hold their ceremony on the blue waters of the Pacific ocean. 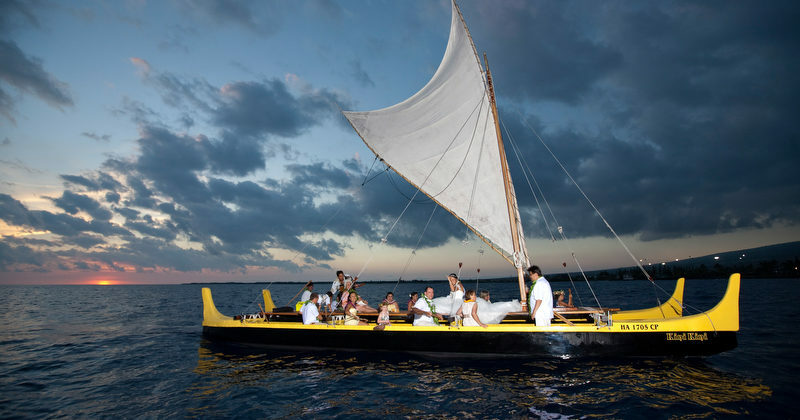 There are several boats available from traditional outrigger canoes to larger catamarans and power boats. Many couples have photos taken on the beach before or after the ceremony as well. The Fairmont Orchid is located on the Kohala Coast and is beautiful resort location. We have been a preferred vendor with the Fairmont since 2005, and always enjoy photographing weddings, portraits, and corporate events here. The Fairmont location has numerous beaches, waterfalls, green lawns and foliage options. This property really has a sense of old Hawaii, from the lighting of the tiki torches at night to the blowing of the conch shell. We have been one of Four Seasons Hualalai's select wedding, event, and family photographers for many years. We are honored by this and reflect it in our work by respecting client privacy, delivering exceptional service, and above all, creating one-of-a-kind, beautiful photographs that you will cherish for years to come. The Four Seasons Lanai is beautiful with all the stunning qualities of a Four Seasons Resort's grounds and views. The island of Lanai is beautiful and remote. If you are looking for a unique location, then Lanai is it. Hale Halawai is a public pavilion in the heart of downtown Kona. While not the most luxurious setting, it offers a large reception area for a lower budget wedding. It is right on the ocean with a beautiful coastline with stunning blue ocean and black lava. A number of Hawaii helicopter companies on the island offer the option of chartering a helicopter for your wedding ceremony and wedding portraits. From secluded valleys, to waterfalls and secluded beaches, you get access to many places otherwise unreachable. Go to locations that would normally be inaccessible, especially trying to hike in with a wedding dress or tuxedo. Located on the west coast of the Big Island the Hilton Waikoloa has about everything you could want in one property; dolphins, their own boat that goes throughout the property, waterfalls, a rope bridge, a chapel, coral beaches, and lots of palm trees and Hawaiian landscaping. We are a preferred vendor at the Hilton Waikoloa and have an extensive knowledge of the property and the best locations for great wedding or portrait photographs. With 11 of the earth's 13 climate zones, the Big Island is the most diverse island in the Hawaiian chain. From beaches to rain forests, the largest of the Hawaiian Islands, the Big Island has it all. And Kaloko is no exception with beautiful and lush rain forests. Be married surrounded by exotic plants and flowers. Kailua Kona wedding photography and Kona portrait photography are our specialties! Based in and around Kona and West Hawaii on the Big Island, we know the lay of the land. This helps us find the best spots to capture unique and exceptional pictures for you. We have been doing photography in Kona over 10 years and hundreds of shoots. We would love to be your Kona Photographer, so please get in touch. Kona Plantation is a great location for a wedding. The property has two two-story houses each with 8 bedrooms and 8 baths, and five acres of fruit trees, palm trees and flowers. There are two lawns for wedding venues along with a beautiful covered pavilion for receptions. You can bring in a caterer of your choosing. The venue has enough locations for all of your wedding photos, plus a few beaches a short drive away. The Mauna Kea Beach Hotel is a hotel property on the Kohala Coast of the island of Hawaii. It sits at Kaunaʻoa Bay. The Mauna Lani Bay Hotel & Bungalows is located on the North West Coast of the Big Island of Hawaii. The resort is full of historical Hawaiian sites including beautiful fish ponds, one of which has a wooden bridge perfect for great pictures. The resort has beautiful white sand and lawn areas for ceremonies as well as lava on the beach for dramatic shots of the wedding gown. Baby turtles, baby sharks, and other fish swim in the ponds inside the hotel. One of my favorite resorts which I have been shooting at for over seven years. Located right in the heart of Kona, Old Airport Beach Park is a great spot for family photos as well as small ceremonies. A long coast line with a mix of lava rock and sand makes for a beautiful backdrop. There is sea grass and a few palms growing along this coast line as well. Although a public venue there are usually not too many people there in the evenings.